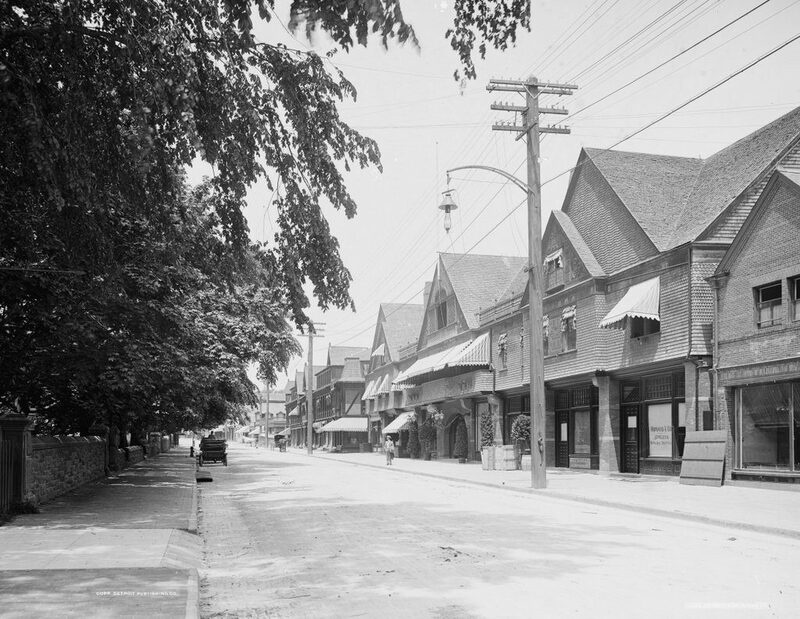 The Newport Casino on Bellevue Avenue in Newport, around 1900-1906. Image courtesy of the Library of Congress, Detroit Publishing Company Collection. One of Newport’s many architectural landmarks is the Newport Casino, which is located on Bellevue Avenue, just a little south of the present-day intersection of Memorial Boulevard. 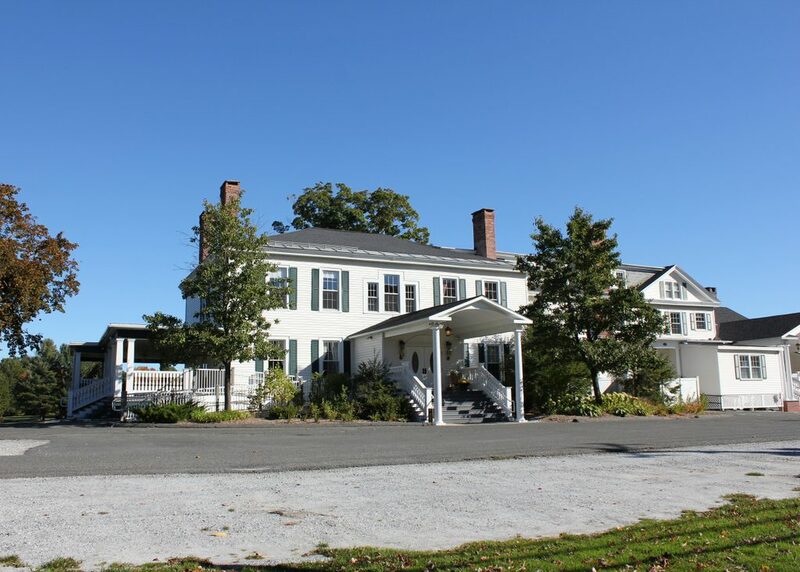 Its origins date back to 1879, when New York Herald publisher James Gordon Bennett, Jr., purchased the Stone Villa house on the west side of Bellevue Avenue, plus a vacant lot directly across the street where the Newport Casino would subsequently be built. Bennett had inherited a considerable fortune – including one of the nation’s leading newspapers – after his father’s death in 1872. Just 31 when his father died, the younger Bennett acquired a reputation as a flamboyant and eccentric member of New York society. Bennett’s famously erratic behavior included an incident in New York in 1877, when he urinated in the fireplace during a party at his fiancée’s house. The resulting outrage ended their engagement and also resulted in a duel between Bennett and his would-be brother-in-law, although neither man was injured. 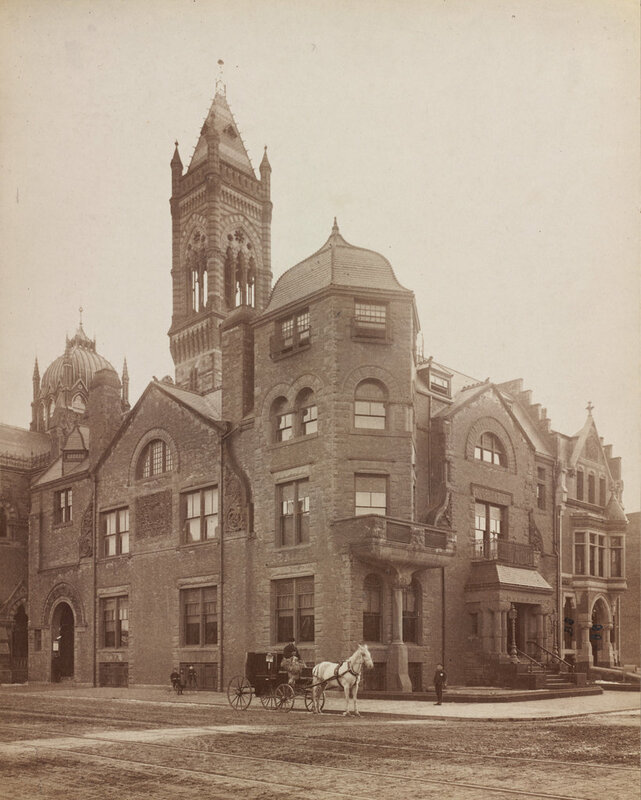 Another oft-repeated – though probably apocryphal – incident happened in Newport in 1879 when, according to the tale, Bennett dared a friend to ride his horse onto the porch of the Newport Reading Room, an exclusive social club for the city’s elite. Supposedly, the friend lost his membership, and Bennett was said to have resigned his membership in protest before establishing the Newport Casino as a social club of his own. 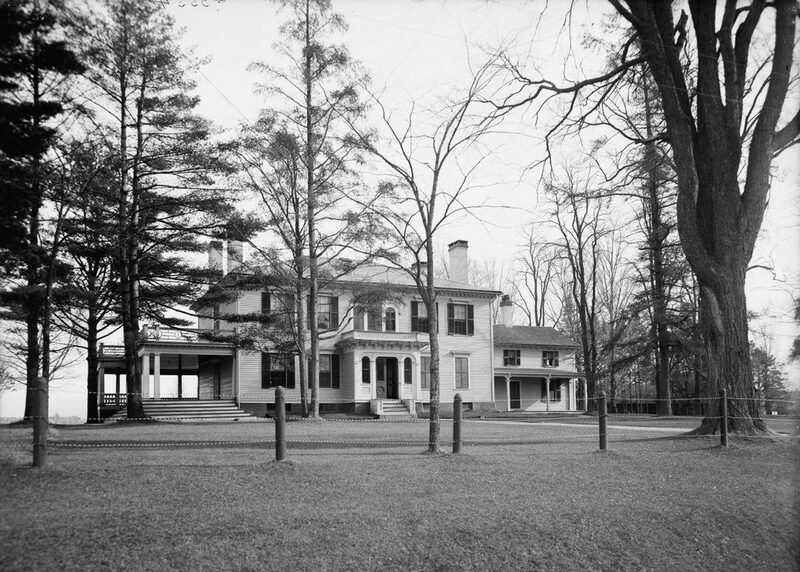 Whether or not the story is entirely true, it speaks to Bennett’s reputation for impulsive behavior, and either way he soon began work on building the Newport Casino on the vacant lot opposite his Bellevue Avenue mansion. For the designs, he hired McKim, Mead & White, a newly-established architectural firm whose subsequent meteoric rise to prominence would be due in no small part to their work here on the Newport Casino. The result was an architectural masterpiece, which was built in 1880 as one of the first significant Shingle-style buildings. 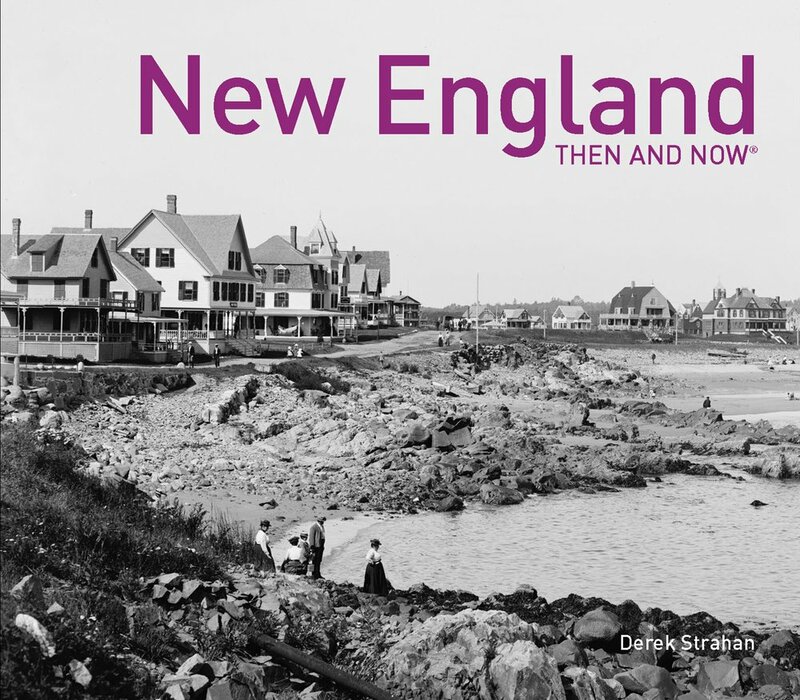 McKim, Mead & White helped to pioneer this distinctly American style of architecture, which would go on to become predominant in New England coastal resort communities in the late 19th century. In 19th century terminology, a casino was not specifically a place for gambling, but instead referred more broadly to a social and recreational facility. At the time of the casino’s opening in the summer of Newport, the city had already been well-established as the premier summer resort for New York millionaires, and the casino quickly became its social center. The building offered a wide variety of amenities, including stores along the Bellevue Avenue facade, plus a restaurant, a ballroom, a theater, and tennis courts. Unlike the elite Reading Room, it was also less exclusive, with both the wealthy members and the general public able to enjoy the facilities. The casino would go on to play an important role in the early history of tennis. Originally referred to as lawn tennis, so as to distinguish it from the earlier game of court tennis, the sport came to America in the 1870s and was played under a variety of rules until 1881, when the United States National Lawn Tennis Association – today’s United States Tennis Association – was established to standardize the rules of the sport. Given its reputation as an affluent summer resort, Newport was chosen as the site of the association’s first championships in 1881, with the newly-built Newport Casino serving as the site for both the men’s singles and men’s doubles championships. The men’s doubles championships would be played here at the Newport Casino for the rest of the 1880s, and the men’s singles championships through 1914. During this time, the sport was dominated by Richard Dudley Sears, a Boston native and Harvard student who won the first seven singles championships from 1881 to 1887, plus the doubles championships from 1882 to 1887, before retiring from the sport at the age of 26. In later years, other prominent winners here included Oliver S. Campbell and Malcolm D. Whitman, who each one three singles titles, and William Larned, who won in 1901, 1902, and from 1907-1911. In 1915, the tennis championships were moved to the West Side Tennis Club in the Forest Hill neighborhood of Queens, which was more conveniently located and could accommodate more spectators. The Newport Casino continued to be used for other tennis events over the years, but both the building and the city entered a decline in the first half of the 20th century, as Newport began to fall out of fashion as a summer resort. 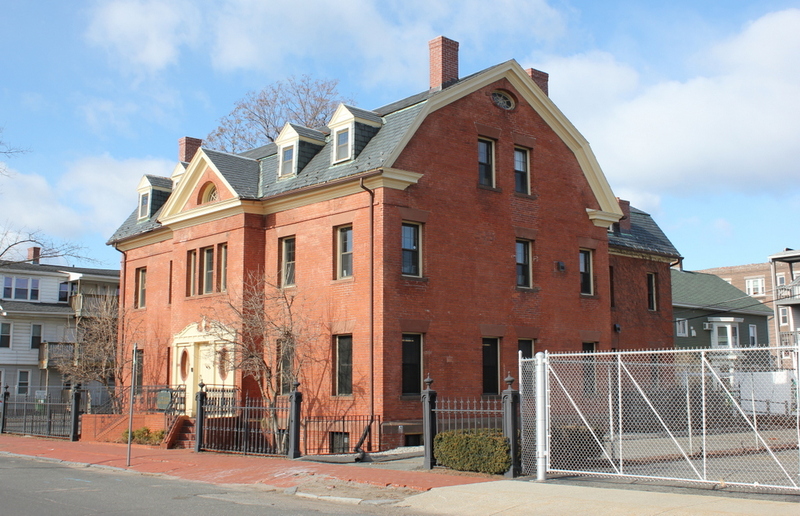 Many of the Gilded Age mansions were demolished in the middle of the century, including James Gordon Bennett’s house across the street from here. Demolished in 1957, the site of his Stone Villa is now a shopping plaza, and a similar fate nearly befell the Newport Casino, which had been threatened with demolition a few years earlier. The Newport Casino was ultimately preserved, though, thanks to the efforts of Jimmy Van Alen, a Newport native and former court tennis champion who established the International Tennis Hall of Fame here in 1954. 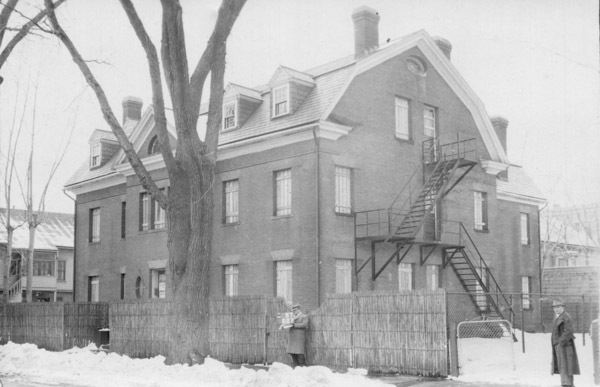 Since then, the building has remained well-preserved, with hardly any changes in this scene since the first photo was taken. The Hall of Fame is still here, along with indoor and outdoor tennis courts, plus one of the country’s few remaining courts for court tennis. 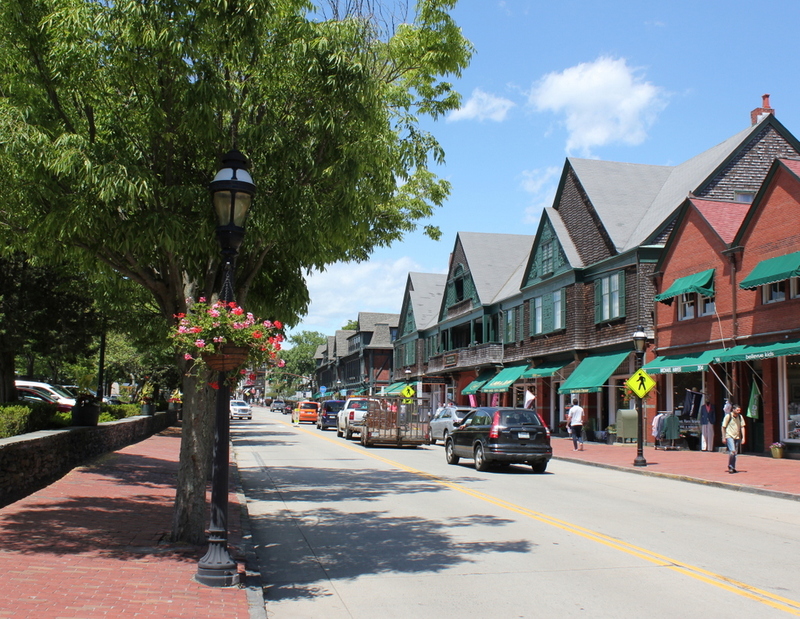 Along Bellevue Avenue, the building’s first floor houses upscale retail shops and a restaurant, and it forms part of a continuous row of historic buildings that extends the entire block from Memorial Boulevard to Casino Terrace. 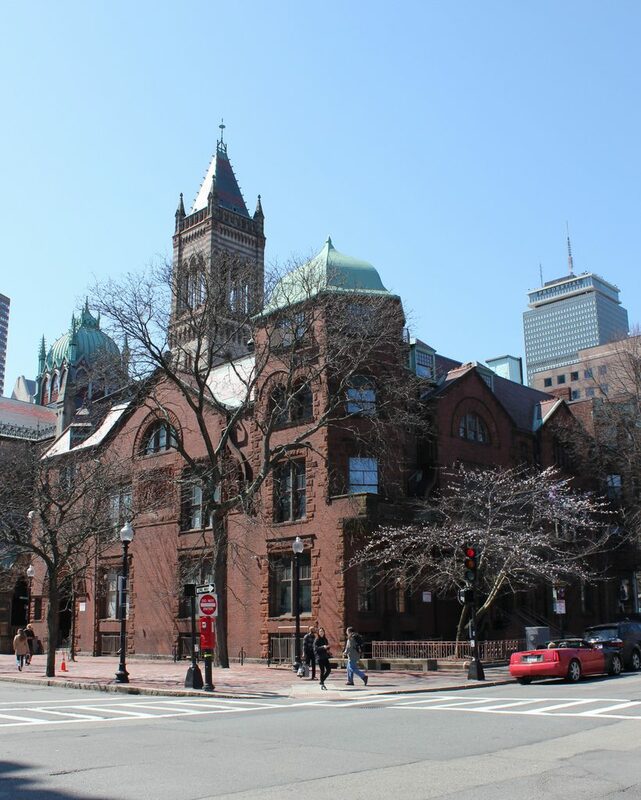 Because of its level of preservation, its architectural significance, and its role in the early history of tennis, the building was designated as a National Historic Landmark in 1987. The Veranus Casino, at the southwest corner of Springfield Street and Casino Avenue in Chicopee, around 1892. Image from Picturesque Hampden (1892). 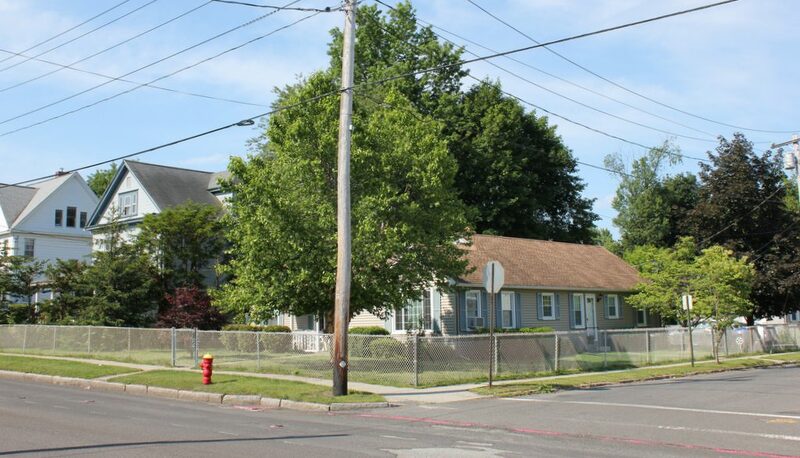 This section of Chicopee was developed in the late 19th century by Frank E. Tuttle and James L. Humphrey, who had purchased 50 acres of land between Springfield and Hampden Streets, just to the south of the center of Chicopee. 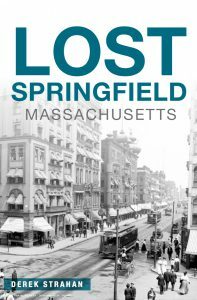 The development was named Veranus, in honor of Veranus Chapin, who had once owned a farm here, and the centerpiece of this new neighborhood was the Veranus Casino, which was located here at the corner of Springfield Street and Casino Avenue. The Queen Anne-style casino building was completed in the early 1890s, right around the time that the first photo was taken. It was operated by the Veranus Casino Company, with Frank E. Tuttle as vice president and his father-in-law, George M. Stearns, as president. Unlike the modern sense of the word, a late 19th century “casino” did not generally involve gambling, and the term was instead used for places that offered a variety of recreational activities. As described in the Boston Daily Globe after the company was established in 1890, the casino would be used for “social, literary, artistic, and educational purposes,” and upon completion the building would include a 400-seat auditorium. The clubrooms are located in the front portion of the building. They consist of handsome and roomy parlors, one each on the two first floors, both being connected with the kitchen in the basement by a dumb-waiter; a ladies’ dressing-room on the second floor; a gentlemen’s smoking-room and a billiard-room on the third. All of these rooms are attractively finished and adorned with rich and tasteful furniture, in which comfort is the evident consideration, instead of magnificence and costliness. The clubrooms are open to members every day in the year, from 10 a. m. to 10 p. m., and are in charge of a gentleman and lady who reside in the building. On Wednesday evening of each week, special receptions are held here by the club families and their children, and on Sunday evenings they all gather here to sing sacred songs, a piano and psalm books being provided. Harmless amusements are also to be found in the rooms at all times, and light refreshments are served therein to all members and their immediate friends who may desire. Despite such fanfare, though, the Veranus Casino lasted for barely two decades. 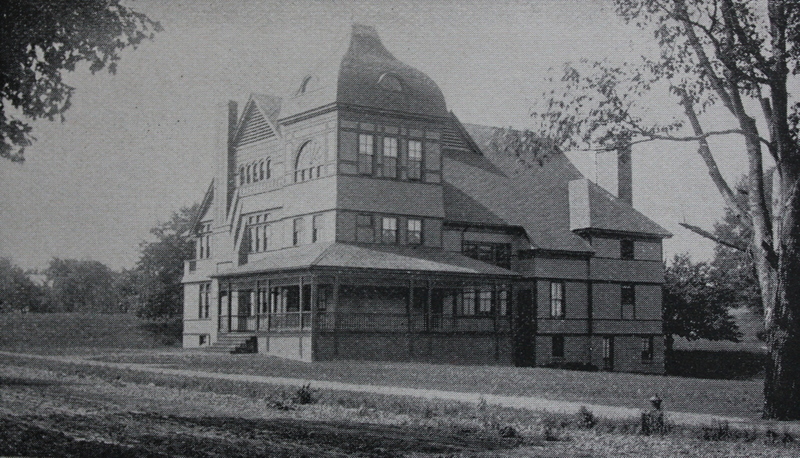 In 1913, the same year that Frank Tuttle died, the casino was sold to the Roman Catholic Diocese of Springfield, and the property appears to have subsequently become part of Elms College, which is located across the street from here. The fate of the building seems unclear, although according to the city assessor’s office the current house on the site was built in 1926. If accurate, this would suggest that the casino was probably demolished around this time. Another view of the Wadsworth Atheneum on Main Street in Hartford, around 1907. Image courtesy of the Library of Congress, Detroit Publishing Company Collection. 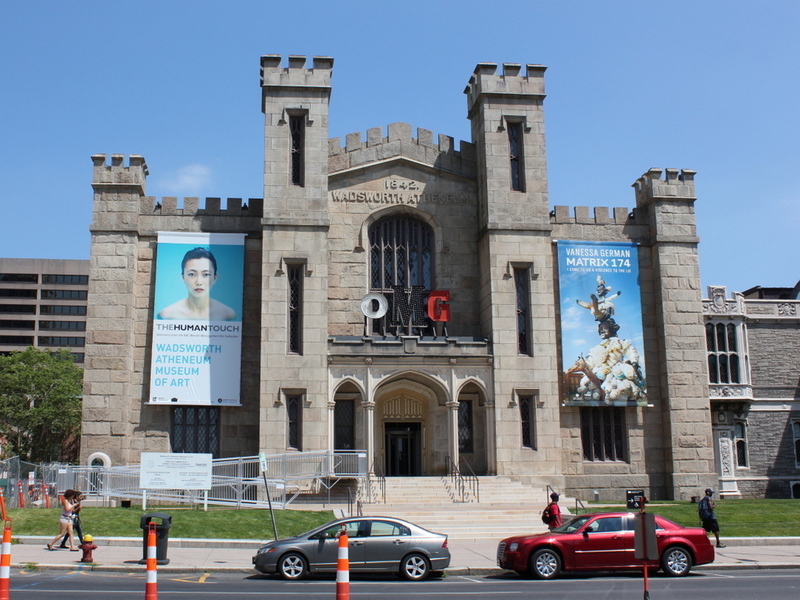 As mentioned in the previous post, the Wadsworth Atheneum is the oldest public art museum in the country. 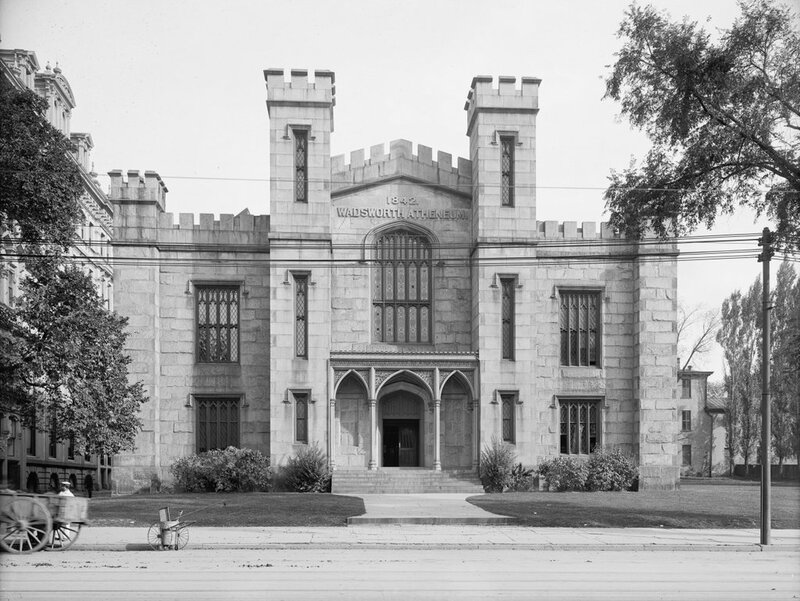 It dates back to 1844, when this building first opened, and although it has been significantly modified over nearly 175 years, the original Gothic Revival facade remains as a prominent landmark along Main Street. Among the museum’s artwork is an extensive collection of paintings by artists of the Hudson River School, a movement that was popular in the first half of the 19th century. The museum’s benefactor, Daniel Wadsworth, was a patron of Thomas Cole, one of the leading artists of this era, and many of Cole’s works are now part of the museum’s collection.